Stevensville Town Hall is located at 206 Buck Street, Stevensville, MT 59870; phone: 406-777-5271. Photo: Albert May House, ca. 1898, 218 Church Street, Stevensville, MT. Listed on the National Register of Historic Places in 1991. Photographed by user:Djembayz (own work), 2012, [cc-by-3.0 (creativecommons.org/licenses/by/3.0)], via Wikimedia Commons, accessed September, 2013. Historic and Architectural Resources of Stevensville, Montana, was listed on the National Register of Historic Places in 1991. Portions of the text below were adapted from a copy of the original nomination document. [†] Adaptation copyright © 2013, The Gombach Group. Stevensville, Montana is a small community located adjacent to the site of the historic St. Mary's Mission near the center of the narrow, north-south tending Bitterroot River Valley. St. Mary's Mission was established in 1841 by Jesuit priest Father Pierre-Jean DeSmet and was the first permanent European-American settlement in Montana. Major John Owen, a former army sutler, founded an Indian trading fort near the mission, and purchased the mission buildings in 1850 when the "Black Robes" abandoned St. Mary's. The townsite of Stevensville came into existence as commercial interests gathered about this early settlement in order to supply goods and services for the earliest white settlers who began to establish farms and ranches in the valley by the 1860s. The exact location of the original St. Mary's Mission, which may have been destroyed by fire, is unknown today. John Owen made his small, palisaded trading post, located just north of what would be the townsite of Stevensville, a symbol of "civilization" in the midst of the wilderness. He cultivated virgin land, imported machinery, built grist and saw mills, introduced improved breeds of livestock, and generally encouraged the agricultural development of the valley by Indians and white settlers. The Jesuits returned to reopen St. Mary's Mission in 1866 and built the log church that currently stands in Stevensville, as well as a blacksmith shop and hospital-pharmacy. Father Ravalli, the resident priest at the mission, gained fame as a physician and ministered to both whites and Indians until his death in 1884. In 1891, the last band of Salish Indians were removed from the Bitterroot Valley to the reservation at Jocko, accompanied by the priests. With no one to maintain the mission at Stevensville, the buildings quickly fell into disrepair. Used by white Catholic parishioners since 1908, the historic mission building has seen a number of restoration efforts. Commercial development in Stevensville has always been inextricably linked to the settlement of the surrounding rich agricultural lands in the Bitterroot Valley. As the methods of raising and types of crops and livestock changed through the historic period, the business community in Stevensville was quick to respond to the needs of the farmers and ranchers. The kinds and personalities of businesses represented in the historic commercial district of Stevensville reflect this evolution of agricultural practices, changing patterns of land use, and the degree to which the community was tied into the national economy in terms of marketing local production and consumption of manufactured goods. The Stevensville townsite was officially platted in 1879 to organize the commercial development that sprang up rather haphazardly to meet the needs of the newly settled farmers and their families. By the 1880s, Main Street was lined with several handsome, single-story, wood-framed, false-fronted commercial buildings. Although all of these settlement period buildings have been lost to the numerous fires that plagued Stevensville, a good number of the businesses that were established during these early years continued to prosper in some form well into the 20th century. Two major mercantile families in Stevensville — the Bucks and the Mays — wielded tremendous influence upon the commercial affairs of the emerging community of Stevensville. The Buck brothers—Amos, Fred, Henry and George—were born in Ohio and raised in Michigan. The three younger brothers followed the eldest, Amos, in seeking their fortune in the West. The Buck brothers were first involved in early Montana freighting, and then took up ranching at Florence, Montana, before finally and most importantly, establishing their retail operations in Stevensville. Henry and his nephew Charles formed a partnership in the Henry Buck & Co. general mercantile, which began when they purchased the store stock of Joe Lomme, a French trader. In the 1880s, Amos and George Buck purchased a second store across the street and began their own company, known as the Amos Buck Mercantile, later reorganized as the Buck Commercial Company. From the mid-1870s through the mid-1880s, the Buck brothers made periodic runs between Salt Lake City or the rail head at Corrinne, Utah to resupply their stores in the Bitterroot Valley. The only buildings remaining in Stevensville directly associated with the Bucks' commercial enterprises are the warehouse and cast concrete block apple storage building located along the alley at the rear of the cluster of Buck family houses on the 200 block of Buck Ave. The May brothers came to Montana from Ontario, Canada. George May, the eldest of the dynasty, left home in 1874 at age 16, apprenticed as a cabinet maker, and then headed West, arriving in Montana in 1881. In 1891, he moved to the Bitterroot Valley with his brother Albert and purchased a band of sheep from John Winslett. The brothers leased old Fort Owen for 14 years from which they operated their ranch. Three other May brothers arrived in Stevensville in 1895: Harry, Charles and Louis. That same year, George, in partnership with his four brothers, formed the Bitter Root Livestock Company and started amassing land. Their interests soon totaled some 3,000 acres on which they ran 20,000 head of sheep and 500 head of cattle. The brothers opened a large and very successful meat market on Main Street. Louis May, with a partner, bought out the meat market in 1909 and expanded the operation. George purchased the George W. Dobbins farm just east of the original townsite for $2,317 in 1899. He subdivided a portion of this land for the May Addition. Based upon this substantial fortune, George and his brother William Harry May bought out the local branch of the Missoula Mercantile in 1900, which they reorganized as the Stevensville Mercantile Co., a concern capitalized at $50,000. The Stevensville Mercantile Co. grew to be one of the largest mercantile establishments in western Montana, handling "anything from a pin to a threshing machine or a sawmill." In September of 1908, the Stevensville Mercantile relocated to the southwest corner of Third and Main Streets in a new building that dominated the downtown. They also constructed a small stone oil and gasoline storage building on the southeast corner of Mission and Third Streets. The mercantile was destroyed by fire and the only building that remains to mark the importance of the Stevensville Mercantile operation is the oil storage building. In business and residence, the members of both the Buck and May families maintained very close ties. Amos Buck built his Second Empire style house at 207 Buck Ave. and set out a large apple orchard behind, which included most of the western portion of the townsite. 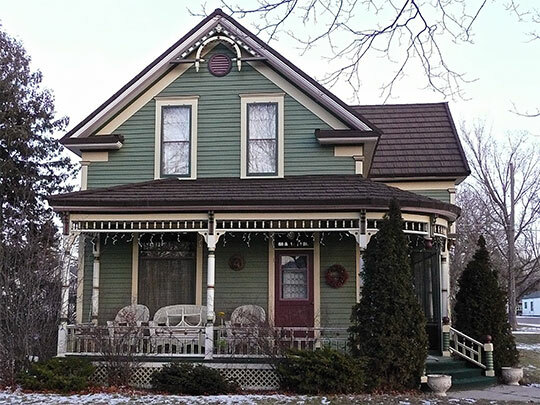 Fred built his house at 217 Buck Ave. in 1886 and Charles located down the street at 405 Buck Ave. in 1906. Charles Amos Buck, the son of Amos and Rosa Buck, built his Craftsman style house between his father's and uncle Fred's houses in 1910. Similarly clustering, Harry and George May built houses for themselves at the east end of Third Street in the May Addition between 1907 and 1909; and Albert located around the corner at 218 Church St., Charles at 109 Church St. in 1909, and Louis at 100 Church St. in 1912. The commercial buildings that exist in Stevensville today almost all date to the 20th century due to a series of disastrous fires that wiped out the early wood-framed, false-fronted establishments. The "Post Office Fire" of August 22-23, 1905 destroyed eight buildings on the west side of Main Street one night, including Misers' Drug Store, Dr. Kellogg's office, the Star Saloon, Stevensville Drug, the Cannon and Bruce General Store and the Henry Buck Mercantile. The Bitterroot Creamery was destroyed by fire on June 20, 1911. A fire at Horticultural Hall on July 30, 1917 burned that building as well as Mendel's Garage and Campbell's Livery Barn. A devastating fire on October 7, 1919 broke out in the Stevensville Hotel, destroying the hotel, the May brothers store, Valley Meat Market, Yantz's clothing store, Schramm's cigar store, Russell and Moore's market, then jumped the street to consume the Amos Buck store, Fauld's Hall, Jack's Shoe Shop, the Montana Restaurant, Dr. Kohl's offices, Willey's Restaurant and the rebuilt Mendel's garage. Property losses were heavy, and many business owners did not carry insurance. The City of Stevensville reacted to the devastation of the commercial establishments on Main Street by passing Ordinance #35 shortly after the 1905 fire. This ordinance required architects and builders to use non-flammable materials in the construction of all new buildings within the designated fire district. The rise in the popularity of cast concrete block in Stevensville may be directly traced to the passage of this ordinance. By the late 19th century, a number of important businesses were established in Stevensville for the purpose of processing and marketing the produce of the area's farmers and ranchers. In 1895, a cheese factory and creamery, the first in Montana, opened for business three miles south of Stevensville, operated by Peter Russell, who later sold out to Francis W. Howard. These early creameries were relatively small operations, producing primarily for the local market. A creamery of larger size required a significant commitment from the community in terms of investment in dairy cattle, production facilities and promotion of a marketing system for the wider distribution of the products. In 1907, the Farmers' Cooperative organized the offering of stock to establish another creamery north of town. The Bitter Root Cooperative Creamery was one of the first farmers' cooperatives to be established in Montana, and provided a ready cash market for the dairy products of area farmers. Under the management of John G. Howe, the Cooperative Creamery produced and sold butter, eggs and ice cream under the motto: "Quality." Probably more than any other single business, the Cooperative Creamery linked the farmers of the surrounding area to a regional marketing system and provided money for circulation within the community itself. A cannery opened in Stevensville in 1914 to process peas, sour cherries and sweet cherries. In 1922, the building burned and the remains were converted into a potato warehouse. A new cannery was constructed in 1925 and continued to operate, employing about 60 people, until 1940 when the equipment was sold to the Red Lodge Cannery. Located near the Cooperative Creamery on the East Side Highway, the cannery also provided an important marketing opportunity for area farmers and added to the economic stability of Stevensville during the historic period. The Stevensville Feed Mill is another architectural expression of the primary importance of agriculture to the economy of town. The Bitterroot Valley was settled on the basis of its agricultural potential, and, at the time the Feed Mill was built in 1918, cultivation and orchard production in the area was peaking. By the 1930s, agricultural implements were sold at the Feed Mill, and the size of the facility was doubled. The business took on the storage and delivery of coal to homes in town, and the name was changed to Stevensville Feed and Fuel. After the Second World War in 1946, a modern grain elevator was added to the enterprise, which allowed the Feed Mill to prosper through the present. Improvements continued through the 1950s with the addition of the pellet mill and steam rollers. During this time, the mill had an exclusive franchise on Purina products. In addition to the numerous businesses that were established specifically to serve the interests and needs of farmers and ranchers, the intimate connection between Stevensville and the outlying agricultural districts also can be seen in the number of farmers and ranchers who maintained homes within the townsite, especially after retirement. Changes in the fortunes of the agricultural sector directly influenced the general prosperity, growth and development of Stevensville. With the end of the intense period of economic growth and land speculation associated with the "apple boom" in the Bitterroot Valley (1905- 1922), a general commercial slow-down settled over the community of Stevensville. The impact of the agricultural depression was exacerbated by the crashing commodity prices in the aftermath of the First World War. By the early 1920s, the community of Stevensville could no longer support the full range of services and stores. While automobile dealerships and agricultural implement stores were just getting established, other enterprises such as the Gleason Furniture Store closed during this time. † Montana State Historic Preservation Office Staff, Montana Historical Society, Historic and Architectural Resources of Stevensville, Montana, nomination document, 1990, National Park Service, National Register of Historic Places, Washington, D.C.